This book was 'ok' for me. In the beginning, I was actually quite into the story, but I couldn't relate to the main character Jules and I couldn't find myself really liking her character even after reading the whole thing. It got a little frustrating and confusing for me when Jules says she doesn't want to stay with her grandfather in the beginning and then suddenly she likes him and then hates him again. I just didn't really get that part. Other than that, I really liked Troy. He was an interesting character to read. One thing I'm not quite sure though, I don't think there should be a future romantic relationship between him and Jules. I just can't imagine it and I don't ship them together. There were some scenes I wanted to read more about and some I wanted to end right away. Sometimes, it seems like this was just a contemporary book. I wish the paranormal aspect was more present because this just didn't bring me to really imagine the world the characters in this book live in. Overall, this book was not bad, but it wasn't really something that blew me away. I know a lot of people enjoyed it considering its high rating on Goodreads and if you're intrigued by the synopsis, go ahead and read this book, you might enjoy it more than I did. I gave this book a 3/5 stars. Evolved Publishing presents the first thrilling installment in "Chosen" by award-winning author Jeff Altabef, and his daughter Erynn Altabef. This fantasy adventure series is steeped in American Indian culture and so much more. Juliet Wildfire Stone hears voices and sees visions, but she can't make out what they mean. Her eccentric grandfather tells her stories about the Great Wind Spirit and Coyote, but he might as well be speaking another language. None of it makes any sense. When she stumbles upon a series of murders, she can't help but worry her grandfather might be involved. To discover the truth, Juliet must choose between her new life at an elite private school and her Native American heritage. Once she uncovers an ancient secret society formed over two hundred years ago to keep her safe, she starts to wonder whether there's some truth to those old stories her grandfather has been telling her. All she wants is to be an average sixteen-year-old girl, but she has never been average-could never be average. Jeff Altabef is an award winning author who lives in New York with his wife, two daughters, and Charlie the dog. He spends time volunteering at the writing center in the local community college. After years of being accused of "telling stories," he thought he would make it official. He writes in both the thriller and young adult genres. Fourteenth Colony, a political thriller, was his debut novel. Evolved Publishing has published Jeff’s second thriller, Shatter Point, which won the Pinnacle Book Achievement Award for Fall 2014 in the category of Best Thriller. 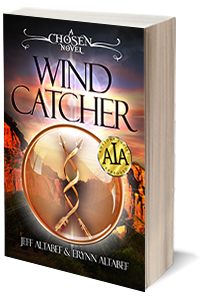 Jeff's first young adult novel, Wind Catcher: A Chosen Novel will be published in March by Evolved Publishing. He's extremely excited that his daughter, Erynn Altabef, is his co-author on the Chosen Series. As an avid Knicks fan, Jeff is prone to long periods of melancholy during hoops season. Jeff has a column on The Examiner focused on writing and a blog designed to encourage writing by those that like telling stories. As an avid Knicks fan, Jeff is prone to long periods of melancholy during hoops season. Jeff has a column on The Examiner focused on writing and a blog designed to encourage writing by those who like telling stories.